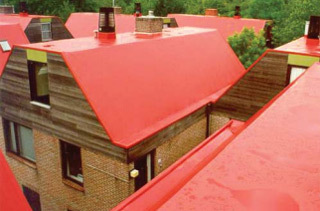 Armourplan SM is a polyester-reinforced PVC single ply roofing membrane suitable for use in a wide range of roofing applications on both flat and sloping roofs. The membrane can be installed onto most common substrates and is suitable for both new build and refurbishment installations and for specialist applications such as simulated metal roofs. Armourplan SM can be either mechanically fixed using suitable IKOfix fastenings or fully adhered and forms a sleek skin on many types of roof application. All overlaps are heat welded using suitable hot-air welding equipment. Armourplan SM is also used as the upstand detailing membrane on all Armourplan SM/SG systems.